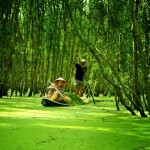 Use the form below to contact tour Mekong Delta 2 days tour overnight at farmer’s house directly. Let’s try a new experience at homestay with farmer house in the original Mekong Delta. Seeing the floating market. Seeing lively activities along river such as fishing, water transferring. Having a chance to wander into the village for seeing local people make sleep mats, make bricks in handy and tasting a delicious coconut in orchard garden. Trying a new experience on “ tuk tuk” or “ xe loi” on shady paths, pass by green rice fields and vegetable plains to be able to touch on really life and find out about tropical culture from Peasants. Depart from Ho Chi Minh cityat 08.00am. It takes one hour and thirty minutes driving to get to My Tho town. On the way, tourists will have chance to see these picturesque landscape along the road such as the green rice fields, the peaceful Vam Co Dong river and the busy Long An town. End route, our bus will stop at Mekong Rest Stop at which you can take a rest and see bonsai garden. Arrive in My Tho town, pay a visit to Vinh Trang pagoda, an oldest ancient one in Southern Vietnam. 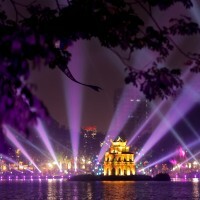 Known as the largest pagoda and famous for the most special architecture in Mekong Delta. 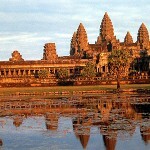 Its architecture was influenced by Vietnamese culture and Khmer’s culture as well as European’s architecture. After passing Rach Mieu bridge, we disembark at Thoi Son Islet, which is set on Phoenix Island. Take a leisurely walking on the village paths, visit local people’s home, orchard garden and enjoy seasonal fruits while listening to traditional Southern folk music. Then visit honey bee farm and enjoy delicious honey tea with lemon which is really good for health. Local people also have python farm for those tourist, who like adventure can take a photo with pythons. 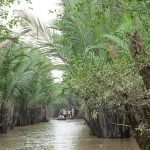 Take a hand – rowed sampan through the creeks for sightseeing the natural water coconut trees-a symbol in the Delta areas. Come back to the motorbike boat then cruising to Ben Tre province, pay a visit to coconut candy workshop to know how to make delicious candies by hand. The highlight of the trip is to take a sightseeing through the peaceful villages by horse cart. Then cruising to Unicorn Island to pay a visit crocodile farm and visit the remains of Coconut belief. Having lunch in orchard garden. Do not forget to enjoy dried Ear Elephant fish that is one of the specialties in Mekong Delta. After having lunch, riding on bicycle through the village paths to enjoy the fresh air and enjoy the pastoral life. Next take a short walking through the narrow village path to the bus and process to Can Tho city. 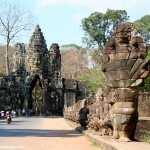 On the way, our tour guide will take travellers the symbol of culture, dining and entertainment places in Can Tho city. Arrive in Can Tho city. Getting to a village in Cai Rang district by motorbike, you will have a chance to meet a kind local farmer’s home in which you will stay the night at their house. In the late afternoon, wandering around the village to see orchard garden or chatting with local people to gain a experience the rural lifestyle of the Mekong Delta resident. Having dinner with family and enjoy some of kind traditional local cuisines. After breakfast at the hotel. At 07.00am, take a leisurely waking to Ninh Kieu wharf. Traveller will have chance to see morning streets market with many products homemade such as fruits, vegetables, cake… are sold on the way to the wharf. Cruising in the river to the busy Cai Rang floating market, which is one of the biggest floating market in Southern Vietnam. Tourists will be excited to explore “the method of the business” in the floating market areas. It is really impressed. After exploring the floating market, tourists will visit the place to see how they make rice vermicelli noodle and the orchard garden. You can wander in the village and try your best to cross the bamboo bridge which is built only by one bamboo tree. After having lunch, process to Ho Chi Minh city. The Mekong Delta 2 days tour overnight at farmer’s house ends at 17.00. Thank you for visiting our Mekong Delta 2 days tour overnight at farmer’s house. We are looking forward to serving you.